This week we’re continuing our Women in Horror Month coverage by peeking into the crib; it’s Veronika Franz and Severin Fiala’s Goodnight Mommy versus Lynne Ramsay’s We Need to Talk About Kevin. We look at both of these films, and what each of them has to say about the horrors of motherhood, the stigma of being a bad mother, terrifying children, and much, much more. We will warn you now ** SPOILERS **!! 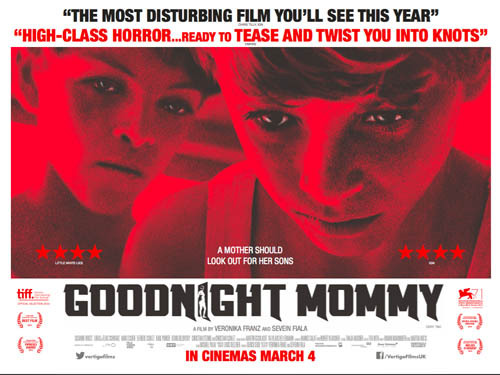 If you haven’t yet seen Goodnight Mommy, please do so before listening to this episode. During the month, be sure to take a look at Ariel’s Letterboxd list of female-directed horror films. It’s at 136 right now – let’s make those numbers climb! Send us a message or email with any suggestions not already on the list!